Our aircraft aren’t replicas or reproductions. They are authentic, vintage aircraft that actually flew during the WWII, Korean and Vietnam war years. 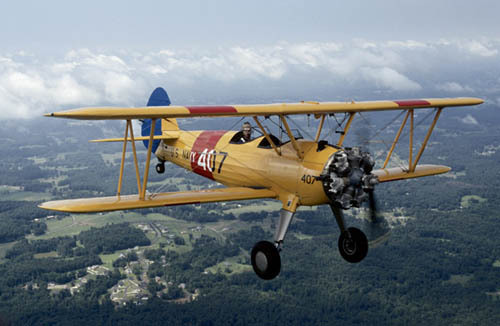 During WWII, the Stearman and the AT-6 played an integral role in America’s aviation history. Literally hundreds of thousands of young American aviators trained in them. 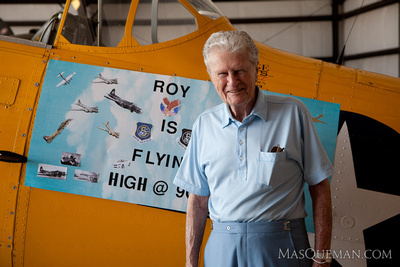 Book a flight today and relive history by flying the same planes and maneuvers taught to cadets during WW II. It will be an experience you will never forget. Both aircraft are dual flight control equipped so you can take the controls and do some of the flying yourself if you wish. Each flight is tailored specifically for you. Vintage Flights offers unique sightseeing and aerobatic aviation experiences in vintage World War II era aircraft. You can fly the same planes the Army Air Corps pilots, Navy and Marine aviators flew as they prepared for combat. Once our restoration is complete, you will be able to jump in the front seat of an open cockpit PT (Primary Trainer)-17 Stearman Biplane and reach out and touch the sky. Enjoy the unobstructed views, the rush of the oncoming air and the rumble of the radial engine. 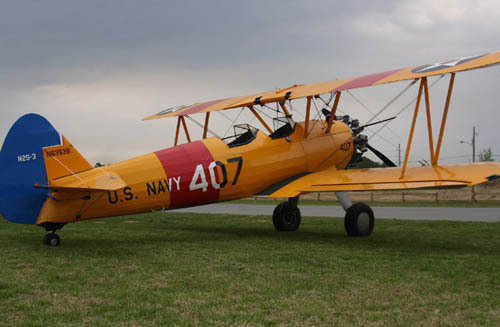 Once Primary Flight Training was completed in the PT-17 Stearman, those destined to fly as fighter pilots, entered Advanced Flight Training and strapped on the Pratt & Whitney R-1340, 600 horse power AT (Advanced Trainer)-6 Texan. From the AT-6 Texan the newly Silver Winged Army Air Corps pilots went on to fly the P-47 Thunderbolt, P-38 Lightning or the P-51 Mustang. From the Navy version of the AT-6, known as the SNJ, the difference being the SNJ was equipped with a tail hook and other modifications to make it carrier suitable. The SNJ (AT-6 Texan) was the first aircraft these Student Naval Aviators flew aboard a carrier. Wearing Wings of Gold, the Navy and Marine Corps aviators flew off our Essex and Jeep class aircraft carriers in the F4F Wildcat, F6F Hellcat, F4U Corsair, SBD Dauntless, SB2C Helldiver or the TBF Avenger. In our Texan, our pilots will share with you and let you experience the same maneuvers used in dogfights and ground attack combat such as the aileron roll, barrel roll, loop and Cuban 8. 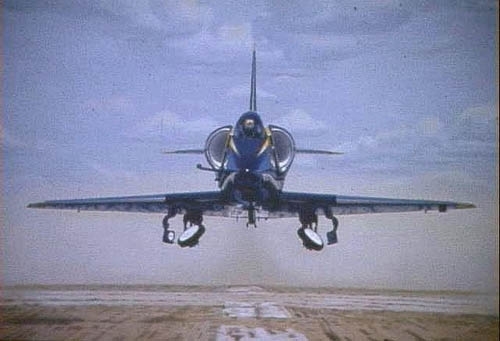 All combat related maneuvers still used today. You’ll love the rumble and the roar of the Texan’s radial engine as it adds just one more memory of your flight experience with Vintage Flights. 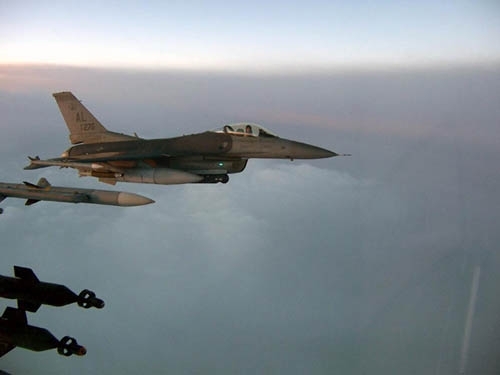 Come share the wild blue yonder with us. Vintage Flights, LLC operates out of Cherokee County Airport KCNI (formerly 47A) Canton, Georgia. Gift Certificates are available and are a great idea for any occasion. We also fly an airshow schedule throughout the year. Check to see if we’ll be at an airfield near you. Aerobatic thrills or sightseeing adventures in our vintage WWII, Korean and Vietnam era warbirds. Warbird rides in Atlanta and more!